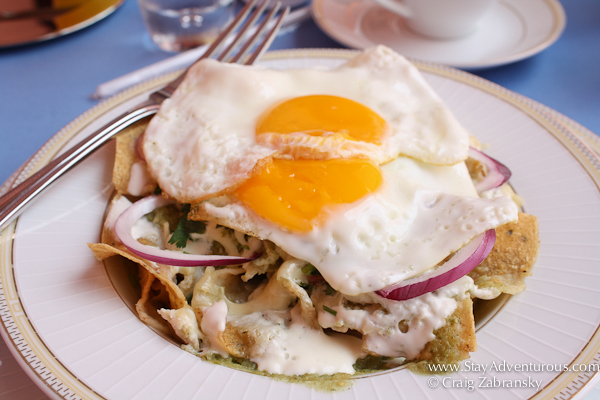 When I travel to Mexico breakfast often, if not always, translates to Chilaquiles Verde. 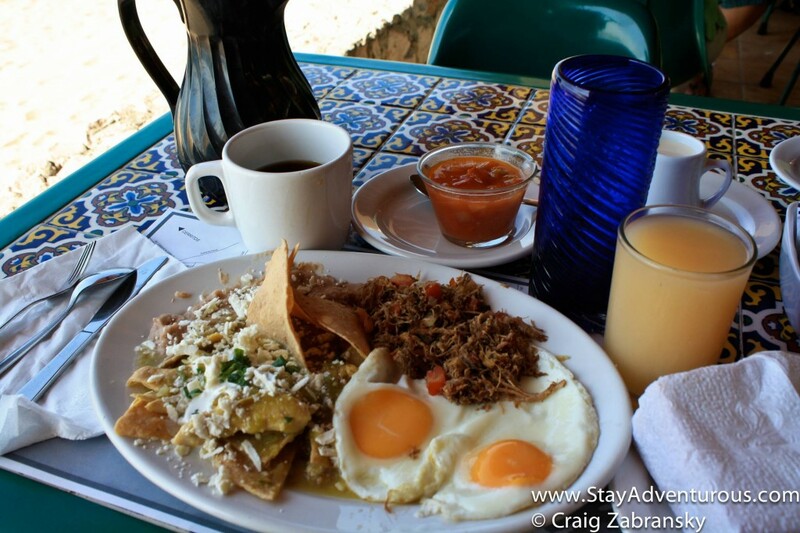 Every trip and everywhere I dedicate one morning (if not more) to tasting my favorite Mexican Breakfast dish. Simply stated, the dish originates from a peasant’s meal (as many great dishes do) with “day old” tortilla chips baked, if not bathed, in salsa (green or red) with onions, crème, cheese, sometimes beans and usually either chicken or a fried egg on top for protein. And for me it is always Chilaquiles Verde or “green” instead of red (rojo) salsa. But still, that doesn’t mean it is the same everywhere. In fact, if there one rule of Mexican Cuisine is each location offers a different version of dish. So, on the recent adventure I made a point, wait no, I wanted to eat Chilaquiles Verde often. And I did. I also thought since each place serve the dish with differences, let me take a look at those difference, let me sample those differences. With a side of mangos. The smaller, boutique style hotel, offers breakfast and dinner included in the price for a room and breakfast is also not to be missed. Chilaquiles Verde did not disappoint here, however, my life-changing breakfast memory from my time at Petit Lafitte was fresh mangos. When in the Riviera Maya in May, make sure you taste the mangos. Wow. Sometimes the plate or bowl itself makes the dish. 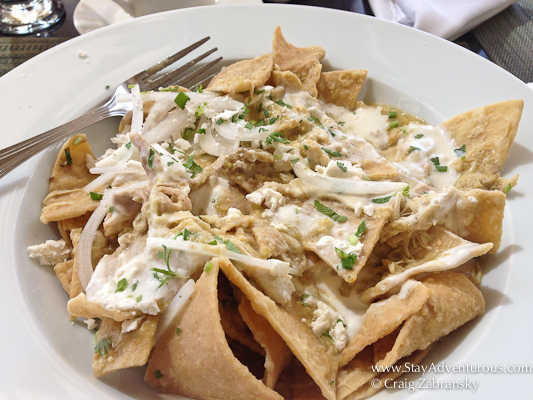 The Westin Cancun offers a breakfast buffet, but I selected the a la carte Chilaquiles Verde. The definite take away as it was served not on a dish, but rather in a bowl. The bowl allowed the tortillas to soak in the flavors from the salsa verde. Nicely done. Even with a large crowd at breakfast inside the large resort, my egg was prepared perfectly. It was easy for the yolk to drip down into the salsa verde. Yum. 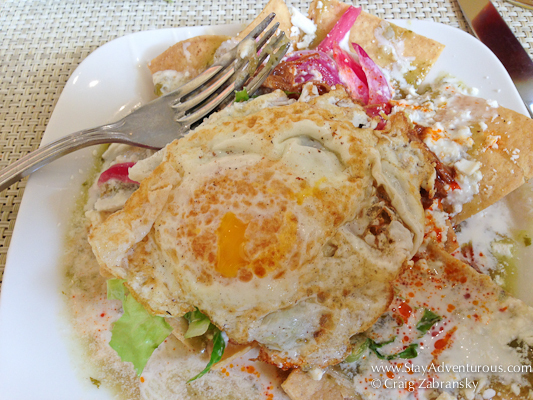 Here I also recommend the Huevos Divorciados, which includes eggs (huevos) with both red and green salsas. On my third morning staying at Dreams Tulum, I wasn’t sure which to order between the two dishes. One morning at the lavish breakfast buffet when staying at Hacienda Tres Rios, I attempted to make my own Chilaquiles Verde. I used a fresh cooked fried egg from the grill and mixed in the ingredients form the Mexican breakfast area myself. I am not sure it look the best, but I certainly enjoyed the added spices. Some like it hot. One of the options when you stay at Casa de Corazon is to have the onsite caretakers prepare meals for you and have it served outside your bungalow. Um, yes, please. 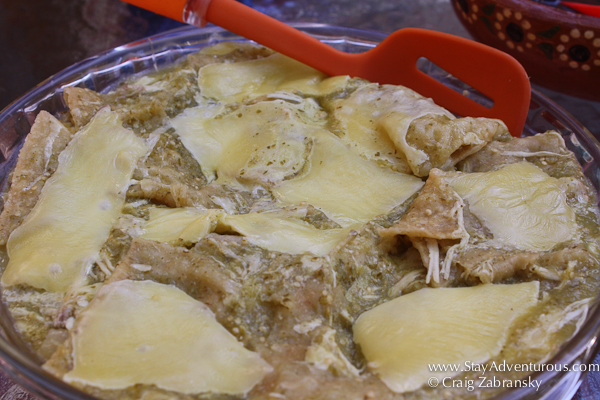 I asked for Chilaquiles Verde for breakfast one morning and received a homemade version. It might have lacked the aesthetics of the other hotels and resorts, but sometimes home cooking is best. I am not sure if the French preparation with fresh Yucatan ingredients style of the restaurant played a role in the cooking of my Chilaquiles Verde, but I do recall the quality of the consistency of the tortilla chips. Also, here I added some pico de gallo for a little color and spice to the dish. The restaurant is available to the public and for the guests who stay at Hacienda Xcantatun. So when you travel to Merida definitely make it a point to have a meal at this award-winning restaurant. Two eggs are better than one? 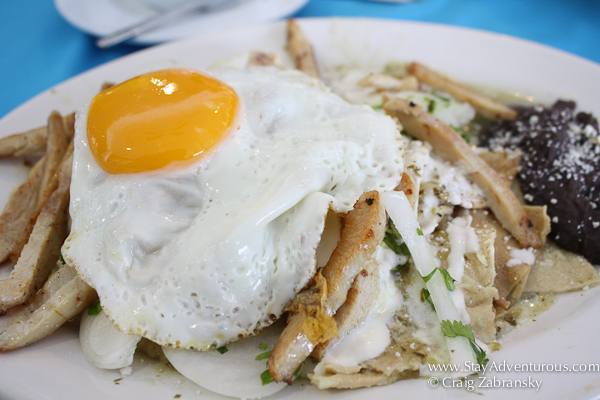 After almost an entire month, my final Chilaquiles Verde came from Casa Azul. The “white glove” service made every meal special and I definitely appreciated the second egg – that’s a good touch too. As you can see, all the same order, but all the dishes look different and were prepared differently. Each unique and frankly, each delicious. 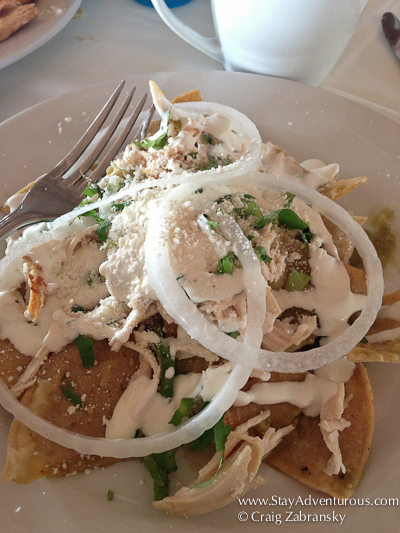 But ok now it’s your turn, based on the photos, which Chilaquiles Verde would you try first? These breakfast look more interesting than just eggs and toast. Would really like to try some of them. 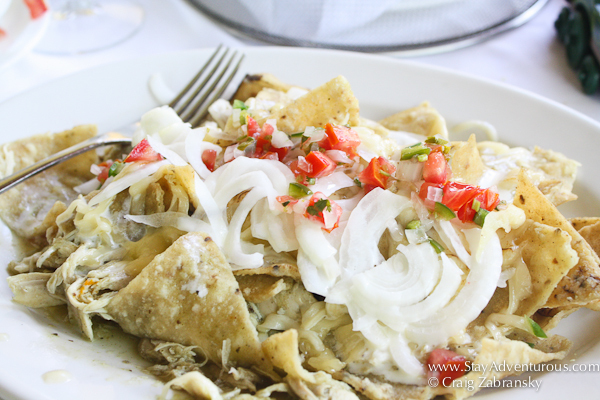 I love, love chilaquiles and actually make them at home from time to time! Thanks to living in a ‘hood with supermercados around (and a Mexican-American friend who is a graduate of a culinary school and happy to share tips). Not sure which ones I’d go for first – I usually do salsa roja, so give me any verde to start with! 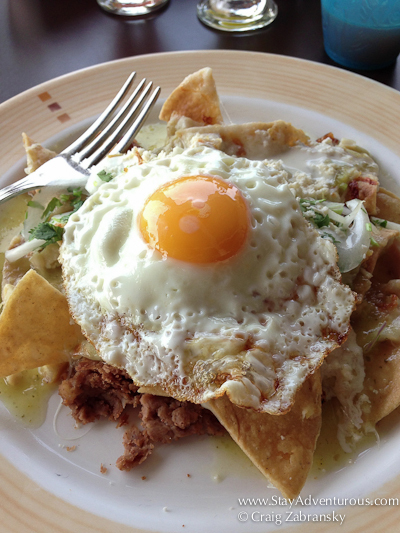 If you can believe it, I first tried chilaquiles in Cabo a couple of years ago. I’m normally a migas or breakfast taco girl. I must say that I now have a third favorite I put in the rotation. Yours look divine.